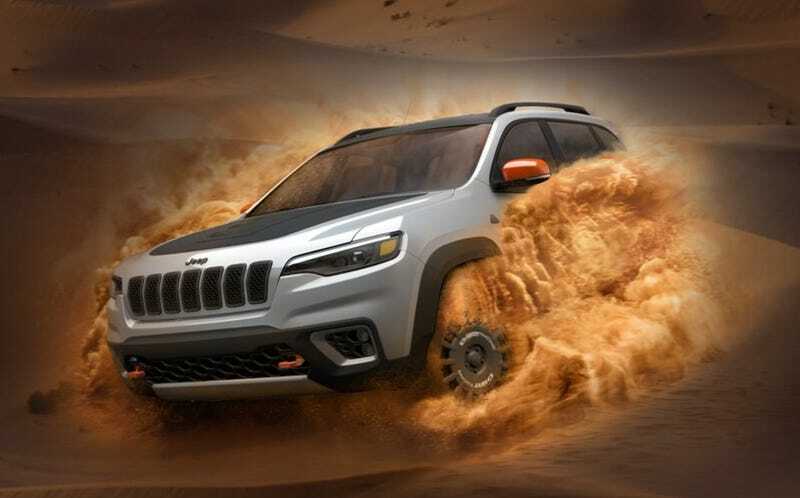 Jeep, the one true extremely profitable son of the Fiat Chrysler behemoth, revealed in their five-year plan for investors today that they want to build a new Deserthawk lineup centered around “ultimate high-speed sand capability.” To that I must say, “do it, fools.” It’s an extremely good idea. While FCA often tosses out some ludicrous ideas and other cool stuff that never comes to fruition in these five-year plans in hopes of drumming up excitement from investors, Jeep Deserthawk models seems pretty plausible. For one, it builds on the existing success of Jeep’s Trailhawk and Trackhawk trim lines, which have been decent sellers for the company geared towards off-road and on-track performance, respectively. Two, every bald-eagle-loving, burnout-appreciating, ketchup-blooded American loves the Ford Raptor, which competently sells the desert lifestyle to even the most mall-bound of bros.
You know FCA wants a chunk of that desert lifestyle cash, so the Deserthawk is a no-brainer. FCA says that their Deserthawk trims will feature “sand performance underpinned by eight desert-specific engineering standards.” Unlike the Trackhawk, which is geared more towards low-speed off-road crawling, the Deserthawk will be aimed towards high-speed blasts through desert terrain. FCA’s five-year plan for Jeep claims the Deserthawk is coming at the start of 2020, and that the trim will likely add an extra $5-10K on top of the base model transaction price. This one actually seems plausible to me, so on behalf of dune hoons and sandless wannabes everywhere, here’s hoping they don’t pull a Dodge Dart SRT with this and make it ASAP.